Often over looked in favour of their more popular relatives, apricots are part of the peach and plum family, bearing the similar round shape and stoney middle. 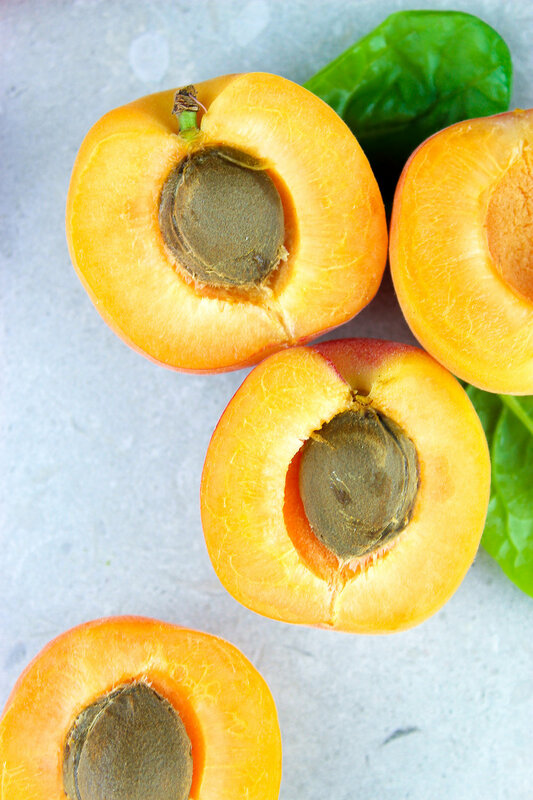 Forgoing the dried variety (albeit still delicious, especially in our peanut butter flapjacks), fresh apricots are a real undiscovered treat, thanks mostly to their mildly sweet, summery taste. Hailed by the Greeks as 'golden eggs of the sun', they are mainly grown in the Mediterranean and Middle East from May through to September - hence why they're so often found in Middle Eastern cuisines. Aside from their savoury escapades, they also make a great compote, crumble or tart - in fact any summer breakfast can always benefit from the addition of apricot. High in vitamin A and C as well as phytochemicals and dietary fibre, they also provide a number of health benefits. - They're also great with savoury. Our favourite is roasted apricots served with roast parsnips, rocket, green beans and puy lentils topped with toasted hazelnuts. - Apricots are also a great option for tarts, galettes, and pies. Perfectly sweet and wonderful paired with an almond pastry. - Apricot jam is always a delicious option too. Strawberry chia jam is a popular choice, but try mixing pureed stewed apricots with a little sweetener and chia seeds for a different take. - They're also a staple in moroccan dishes. Try adding to a stew with other moroccan flavours such as paprika and cumin. Add slow cooked lamb for a meat option of chickpeas and butternut squash for a veggie alternative.